Have you ever wanted to be an internet superstar? Now you can - LITERALLY - with this exciting clicking game that I have dedicated hours of my life to making. Clicking gets you hits, but it also might hurt your site quality! Use your clicks to buy help and power your blog into the blogosphere! Hits are what happens when people click on your blog. The more hits you get, the more exciting upgrades you can unlock. The more users that use your site, the more precious bronybucks you rake in. Bronybucks can be used to buy things like pizza and pizza. The more exciting content that goes on your blog, the more infamous you become. Can your infamy be the key to attracting the attention of Trixie? Making a website is hard. Watch out, some upgrades might hurt your site quality! Site Quality unlocks special items and helps you pay for things. Keep it high or you'll never win! Convert all your hard-earned Brony Bucks into Unicon Bits! Getting help for your blog naturally produces infamy and quality, but most importantly, users. Users produce precious hits and bronybucks. There are exciting friends such as Knighty, Horse News and Cereal Velocity to help you out. Also Seth's Waifu collection, as Seth is a strange man. A: Yes. You win when you marry Trixie. You need high quality though! Trixie won't marry you if your site is low quality. Q: How many upgrades are there? Q: What do the upgrades do? 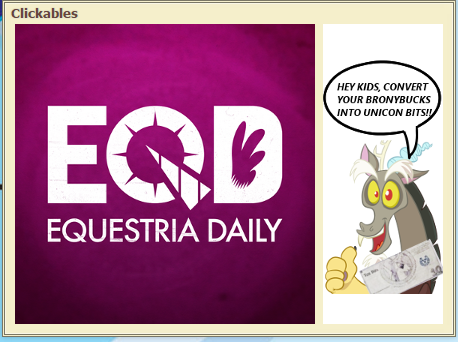 A: EQD Clicker is an uncannily lifelike simulator of the website Equestria Daily. Q: Why are there no achievements?